Alex Vortignon, Gallery of Man, W.A. 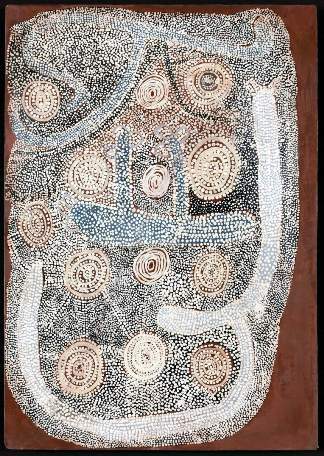 This painting is a beautiful but complex and elaborate pictorial composition delivering in great detail, the vastness of the Gibson Desert. Symbols of trees, hills, caves and vegetation within this immense region are represented. The sweeping arms of the landmass act as a water-shed to supply several important water and ceremonial locations.